Indoor applications are our specialty. We work directly with the manufacturer to provide durable and highly refined no-infill turfs for all sports applications. You can sprint, jog, play or jump without fear of loose debris. 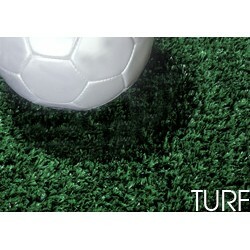 Our turf flooring is ideal for football, soccer, baseball, and sports performance facilities. 1/2" Turf with 5mm underlayment, 12' wide. The PureGrass™ System is the best overall surface ..